We are celebrating Dessert Week, and I enlisted my friend Alicia to blog her favorite dessert this time of year, homemade ice cream. You may recall, she is the one who made me my delish Amaretto Spice Cupcakes for my birthday. Enjoy. The summer heat always gets me in the mood for a cold, sweet dessert and I was inspired recently after watching a few cooking shows to try making homemade ice cream. This easy recipe is a perfect cure for an ice cream craving and will have you saying, “more please” in no time at all! The plus side is that you know each and every ingredient you are using and can create a flavor all your own. Since there is no ice cream maker needed, anyone can enjoy the taste of homemade ice cream with just a mixer and a little imagination. Whip the condensed milk and whipping cream in a large bowl with a stand or hand mixer until it looks like whipped cream. That’s your homemade ice cream base. 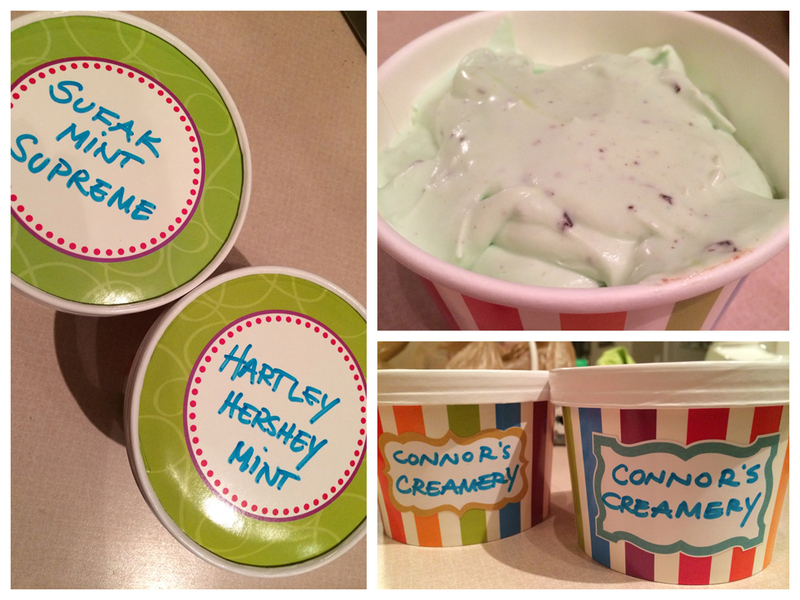 Mint Chocolate Chip – Add chopped chocolate and 3 to 4 capfuls of peppermint extract to taste. Java Chip – Add 2 tbsp of espresso powder & chocolate chips to the base. Rocky Road – Mix in a packet or 2 of hot cocoa mix & marshmallows. Try your favorite fruit, chocolate, or be courageous and add some French toast to your homemade ice cream. You never know where your imagination might take your taste buds. The possibilities are endless and the best part is that you control exactly what you’re eating. I recently gifted some homemade ice cream to my son’s preschool teachers. You can purchase ice cream containers at a local cooking store and fill them with a custom flavor. Get creative with a custom name, and anyone who receives this sweet gift will be gleeful.